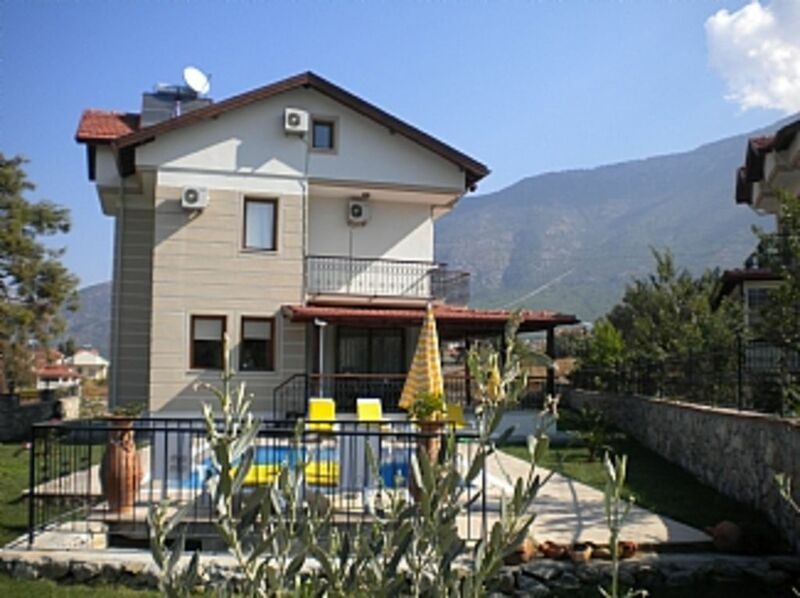 This four bed detached property is situated within 5 minutes walk of the main town of Hisaronu.Three of the bedrooms has their own balcony The villa is surrounded by mountain views. Villa Haze has a private pool and sleeps 8 comfortably. Fully air-conditioned throughout. Equipped to a high specification with top of the range appliances including: washing machine, fridge freezer, microwave/grill, gas hob with electric oven, toaster and kettle. Range of pots/pans and cutlery. A 140 year old door that has been converted into a dining table - seating for 8. Fully furnished lounge with satellite TV and DVD/CD player, complete with a range of DVDs/CD's for your enjoyment. Coffee/games table. Xbox 360 with an assortment of games. There is a built-in safe for your convenience. I am married with two children that visited Hisaronu in August 2010. We had not been to this part of Turkey before, but completely fell in love with the scenery and most of all, the locals -they are just fantastic! We bought the property in October 2010 which resembled a building site, however, in May 2011 we furnished the Villa and have turned the property into something we believe is not just special to us - but sure you will love it too! Look out for these special features. A 140 year old door that was made into a dining table. A ships bell - dating back to the 19th Century. A Horse Shoe - to bring you luck! The scenery is breath-taking. Villa Haze is within 5 minutes walk of the excellent facilities to be found in Hisaronu - entertainment capital of Oludeniz with its many shops, bars and restaurants. Oludeniz itself with its many water sports, hang gliding, Para-gliding. Oludeniz has excellent beaches and a lagoon, with Babadag mountain providing a stunning backdrop (UNESCO designated area of natural beauty) is 3 km bus ride away. Fethiye town with its attractive marina, many shops and Lycian and roman ruins is only 6km from the Villa. Villa Haze is Ideal for families or friends wishing for a relaxing Mediterranean holiday in stunning surroundings. This is a four bed detached property with private pool sleeps 8. Fully air conditioned throughout. Equipped to a high specification with top of the range appliances including: Washing Machine, Fridge Freezer, Microwave/Grill, Gas Hob with Electric Oven. Toaster, Kettle. Range of Pots/Pans and cutlery for 8+. A 140 year old door that was converted into a dining table - seating for 8. Fully furnished lounge with satellite T.V and DVD/CD player. Complete with a range of DVDs for your enjoyment. Coffee/games table. There is also a built in safe for your convenience. Downstairs shower room. First floor - 3 bedrooms (2 x double & 1 x 2 single) each with its own private balcony. Includes wardrobes and bedside cabinets. Shower Room. Second Floor - shower room with 2 x single beds. Equipped to a high specification with top of the range appliances including washing machine, fridge freezer, microwave/grill, gas hob with electric oven, toaster and kettle. Range of pots/pans and cutlery for 8. A colour TV is available for your convenience. For small children there is a mixture of toys. A brick built BBQ is available for your convenience. The BBQ faces towards the veranda - and will sheild you from both sun and rain. The veranda covers two sides of the villa which also houses a hammock. Notes on accommodation: Built-in safe for your convenience. Free Wi-Fi Shower and Pool towels are provided, however, pPlease bring your own towels for the beach. Outside: Well established fruit trees. Swimming pool with mood lighting (7. 5 x 4m). Sun loungers. Patio table and chairs for 8. Hanging swing. BBQ and Fire Pit Giant outdoor games. OXO dominos, swingball and table top games. Cleaning / Towels / Linen / Maid service: Towels and linen are included. The property is cleaned before and after your stay, however, a midweek clean can be provided at your expense. Fully air-conditioned. Towels should not be removed from the villa during your stay. Other: Giant outdoor games to keep everyone entertained. Spotlessly clean. The villa is very well maintained and too a high standard. There is nothing this villa lacks. villa Haze stands in its own ground and is situated very close to the town of Hisarönü about 5 mins walk and is close to all amenities. The gardener come daily apart from Sunday and is extreamly helpful. I would highly recommend this villa and am looking to book next year. Nearest Beach is Oludeniz. 3km drive either by car, taxi or local bus (dolmus). Oludeniz itself with its many water sports, hang gliding, Para-gliding. Oludeniz has excellent beaches and a lagoon, with Babadag mountain providing a stunning backdrop (UNESCO designated area of natural beauty). Nearest Airport is Dalaman. 35km drive (50 minutes drive). Car Hire and taxis are available which we can also arrange on your behalf. All you need to do is: decide when you want to go, book your flights, sit back, and we will do the rest. Let us take away your stress of orgainsing transfer, car hire, trips, etc. You name it - we'll sort it. If we can't, we'll do our best to find someone that can for you. Villa Haze is within 5 minutes walk of the excellent facilities to be found in Hisaronu - entertainment capital of Oludeniz with it's many shops, bars and restaurants. Local super market - 3 mins walk. Approx 10 TYL for a 19 litre water cooler which can be dlivered to your door. Why carry it from the super market when it can be delivered for free. Booking Notes: 20% non refundable booking fee required. Balance due 90 days prior to departure. Cheque or bank transfer. £25.00 non refundable breakage charge required on final balance. Changeover Day: Preferable Monday - however, will try to accommodate your requirements. Accomodation available from 14:00hrs on the day of arrival. Departure by 12:00hrs. If you have a late departure flight we may be able to accomdate this at a small fee.